When a book gets so much attention as to warrant thousands of blog articles, discussions, and specific sermons in regards to its story and theology, it leaves one considering the implications of such a book. The Shack, no doubt, has left a ring both negative and positive, in the hearts and minds of many a people, at least for now. Will that ring continue? No one truly knows. But, if you don’t mind, I like to let it ring for a just a little longer, at least three articles of my own. After reading the book, and then reading such articles, discussions and watching video footage about the book, it has left a desire to give not only my own assessment of the book, but an evaluation of other’s viewpoints as well. Thus, I ask your patience to humor me for the next few days as I compile my own thoughts on The Shack. The Shack is about one man, Mackenzie Allen Phillips, or Mack for short. (I parenthetically point out that it is most likely that even though the author, William Paul Young, is a secondary character in the book, the main character, Mack, probably portrays many of the spiritual struggles that Young has dealt with in his own life.) The book is basically about Mack’s weekend experience with the Trinity – Father, Son and Holy Spirit. In the not to distant past, Mack’s daughter, Missy, had fallen into the hands of one perpetrator who had abducted her and then murdered her (he’s known as the Little Ladykiller). Missy’s body was never found, only her blood-stained dress in a shack just outside a small town in Oregon. As one would expect, this caused grave pain for the whole family, and in particular, Mack’s pain is referred to as the Great Sadness. One day, Mack finds a note in his mailbox inviting him to visit the shack, presumably the place where Missy had been murdered, and the note is signed, ‘Papa’. Interestingly, ‘Papa’ is the name that his wife, Nan, uses when referring to God. 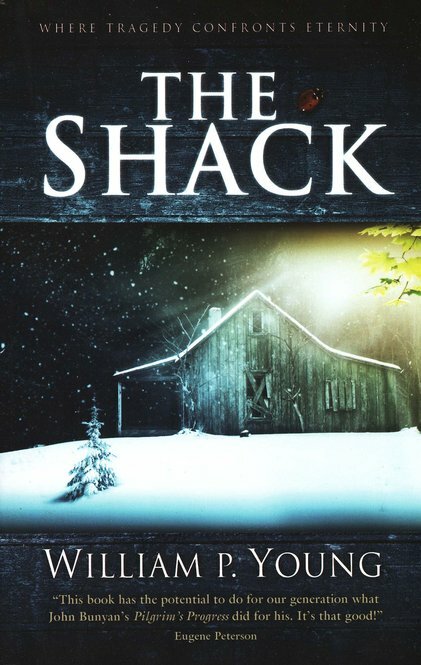 Though he first thinks he is out of his mind, as any normal human would, Mack heads to the shack not knowing if he is going to encounter the murderer, or possibly God. In the end, the shack is unexpectedly transformed into a beautiful place, almost holiday-esque, and this is where Mack encounters the Father, Son and Holy Spirit, or otherwise known as Papa, Jesus and Sarayu. Through this weekend encounter, Mack’s life is quite revolutionized and he walks away a changed man forever. There is no doubt Young has written the book for a purpose. The page directly before the Foreword states that the book is for his six children, which I probably guess it started out as such. But there is no doubt that William Young also has a purpose in getting the book, and it’s spiritual thoughts, into our hands. I see nothing wrong with that, but I only assume he wanted us to read it, hence you and I have a copy. He had experienced something that he felt others needed to hear about. Thus, you have The Shack on the shelves of almost every bookstore, and even other stores and shops. There are obviously differing views concerning the book, and if you didn’t realize that, I would encourage you to consider looking and reading outside your own particular church community. No doubt some see this as a beautiful, yet fictional, masterpiece portraying God’s heart to humanity. Yet, others swing to the complete opposite side hailing the book as blasphemous and full of theological error. For me, I want to try and give the book a fair review, trying to evaluate it as faithfully as I can. What I mean is that I will point out possible theological holes, yet, all the while, challenging those who claim the book as heretical and blasphemous. After hearing much of the discussion concerning the book, there seems to be seven major problems that some people have with the book (obviously there might be more than these seven). And so, I want to address those seven problems, noting if they are worthy of being labeled as theological error, or at worst, heresy, or if we could possibly deal with them in a much more reasonable and level-headed way. While reading and hearing various people’s thoughts on The Shack, one of the first things to arise is that the book seems to teach universalism. What is universalism? It is basically the teaching that all will be saved and reconciled to God in the end. Thus, the logical conclusion is that no one will suffer punishment for sin. Most Christians see this teaching as directly opposed to the teaching of Scripture, as do I. A few Scriptures that point out that some, if not many, will receive punishment for sin are Matthew 7:13-14; 7:21-23; 25:46; John 17:12 (Judas being the ‘son of destruction’); Romans 9:22; 2 Thessalonians 1:9. And those are just a small sampling. But, the question is, does The Shack really teach universalism, or that all will be saved and reconciled to God? In the sense of all of humanity being created by God, we are His children. But in the special sense for Christians, we are children only because we have faith in Christ. The claim is that, since Papa stated, ‘I am now fully reconciled to the world,’ this means Young is trying to teach all will be saved. Mack, himself, even has a problem with the phrase, ‘the whole world’. Maybe at first glance, for a heresy hunter, this is teaching universalism. But I think this is easily understood when we consider the whole of the quoted context. True, Papa did say the whole world is now fully reconciled to Him. But I don’t think Young was trying to hammer the point that everyone would be saved. For, consider that Papa goes on to explain that He has done His part, but that this is a two way street, presumably hinting humanity must respond by believing upon Christ. Thus, I am not sure if Young is trying to teach universalism and that all would be saved regardless of their faith confession in Christ. It is quite possible that he is trying to get across that God has done His part in the cross and that, now, He awaits a response from humanity in regards to His Son’s death. If anything, the words seem to be possibly combating the reformed doctrines of limited atonement and unconditional election. Limited atonement teaches that Christ’s atonement was only for the elect. Unconditional election espouses that the Godhead chose those whom would be saved before the creation of the world, and this was not due to any foreknowledge of humanity’s choice, but rather solely upon His choosing grace alone. I believe Young is more challenging those two doctrines than declaring an outright universalist view. I believe these words simply teach the viewpoint of unlimited atonement (that Christ’s atoning sacrifice was for every human being) and that the cross has provided the opportunity for forgiveness for all of humanity, but human beings have to choose to relate to God based upon the cross event. One might not hold to a doctrine that says Christ’s atoning sacrifice was for every individual for all time (meaning you fall in the limited atonement camp), but no one has ever been counted a heretic for believing in unlimited atonement. No doubt these words have caused problems for many, and I can understand such hesitancy with the above quote if taken at face value. Along with the words above, many people will also refer to one of William Young’s television interviews, which you can watch on YouTube. In the interview, Young states that the original manuscript did not say, ‘They were Buddhists or Mormons…,’ rather it read, ‘They are Buddhists or Mormons…’ You see the difference, and the problem for some? Yet, I think Young did well to explain his intent and heart in the interview. His purpose was to show that Christ was willing to go down any path – Muslim, Buddhist, Baptist, Mormon, etc. – to bring a person to Himself. Christ is like the shepherd who would leave the ninety-nine sheep and ‘go in search of the one that went astray’ (Matthew 18:12). He is one willing to walk down any path to bring someone to Himself, for consider what Christ was willing to do on behalf of you. Or, in the words of Young, Jesus will walk into the ‘Muslim camp’ to woo a Muslim to Himself. That is beautiful! Now, no doubt, after watching the interview, I would say Young’s semantics are somewhat different from my own. I see a small misnomer in his language use here: he speaks of a ‘Muslim’ or ‘Buddhist’ in more of a cultural and national sense, rather than from a religious or spiritual nature. Therefore, it seems Young might see Muslims as those who live in the middle-east or Buddhists as people who live in China. It’s quite like Muslims equating Americans as Christians, which we know that association is not true or helpful. Yet, if Young wants to use the word ‘Buddhist’ or ‘Muslim’ in a cultural sense, then, yes, we could say there are Christian Muslims, for he simply means there are Christians in the middle-east who used to have allegiance to Islam. Personally, I think it a misnomer to use these descriptive words in a cultural/national sense, but rather seeing them as referring to someone’s religion/faith. But, from his own explanation, I do understand Young’s point. In regards to Jesus’ words, ‘I’m not a Christian,’ I think we can easily discard these as problematic. He is actually the Christ, and it is Christians that name themselves as such because they are followers of Him, the Christ. Jesus would not describe Himself by the same name by which His followers are called. Yet, people will still point out the problem with Jesus’ statement, ‘I have no desire to make them Christian.’ Yet, I think we must bear in mind the overall intention of Young to combat against an overly religious, dogmatic and stuffy Christianity that has developed within those who see Christianity more as an institution rather than a living body and Bride. And we cannot forget that Young emphasizes that Jesus still wants to ‘join them in their transformation into sons and daughters of my Papa, into my brothers and sisters, into my Beloved.’ Therefore, these words from p182 do not bother me knowing The Shack has been written to challenge the more boxed and overly religious version of Christianity. Thus, in all, I don’t think we have to read Young’s words as specifically espousing universalist doctrine. Rather, I believe he is combating the very minutely defined reformed doctrines of limited atonement and unconditional election. For him, he probably sees reformed Calvinism as somewhat fatalistic and dogmatically defined (I am not saying what I believe here, I am just hypothesizing what Young might have been trying to accomplish). It seems Young is trying to move the walls of the box back, just a bit, from a more defined reformed perspective, rather than completely knock the walls down and inherently embrace universalism. I really don’t think I need to spend much time assessing this claim that Young does not view Scripture as sufficient for our faith. Considering the quote above, one can intelligently conclude that Young is not trying to negate the importance of Scripture, but rather the dogmatic approach that declares God no longer communicates with humanity, by His Spirit, due to the formation of the complete canon of Scripture. No doubt many a great men and women of God believe God still speaks today by His Spirit, yet such communication from God must be considered and weighed with the canon of Scripture, our measuring stick of the faith. And I believe this is where Young would lean. I love the Scriptures. They are worth reading, studying, meditating on, and so much more, for they are the revelation of God. I do this myself regularly, and would encourage all of God’s people to do the same. But I also believe that the same Spirit that indwelt Christ and the first apostles has also taken up residence in His people today. Thus, our God wants to develop a communicative relationship with us. And, therefore, I seriously doubt that Young is trying to show the Bible as insufficient. Rather, considering the whole nature of the book, he is most likely trying to swing the pendulum and emphasize the relational nature of God, even with a completed canon of Scripture by which we can measure such possible revelation and communication from God. Accordingly, my challenge, along with Young, would be that we look to cultivate that relationship by regularly communicating with, speaking to and listening to our personal and relational God. Well, I think that is enough for now. Thanks for staying with me. In conclusion to this first installment on The Shack, I do not think William Paul Young is trying to proclaim universalism, nor that the Scripture is insufficient as a measuring stick for our faith. Young is, rather, trying to challenge a dogmatically articulated doctrine in regards to the nature of the atonement, and possibly election, as well as a defined doctrine that says God no longer speaks to humanity today. My next article should come in the next day or so looking to assess the claims that Young holds to a lack of justice in the character of God, a lack of God’s sovereignty, and the doctrine of open theism. This entry was tagged book review, books, The Shack. Bookmark the permalink. All good fiction requires a certain amount of ambiguity. Great authors present their viewpoints subtly throughout the story while leaving a certain amount of room for interpretation. Only christian-market writers try to embed a theological textbook into their fiction. And only christian-market reader expect them to. As usual, western Christians are so consumed with being “right” that they have no time to explore what is good. Good work Scott, hope to see you again soon. I do believe that, in general, Christians will want to communicate some divine truth even through their fiction. Those things that we hold dearly to will spill out into all areas of life, especially as we pour out our words and thoughts into books. But, fiction is story, and within story everything does not fit so nice and neatly into a package. I’m not even sure Christ’s stories were so theologically packaged. That could have been one of the reasons the religious leaders hated him. His stories captured people’s hearts, drawing them in, but it didn’t honor their traditions and theological exegesis of the Law. Funny how we give Lewis and Tolkein much more room to breathe in this area than most other ‘Christian fiction writers’. I guess they ‘proved’ their worth. The rest of us are battling up hill. And no doubt we, as Christians, will expect to see some hints of redemption in the fiction writings of Christians. It’s just that we want them to communicate things in exactly the way we think things should be communicated. The name Jesus must be mentioned at least so many times, their can be none of this or that, etc, etc. But that is the point of story – it draws people in because it looks at life and all its aspects, even the hurts and evils. Obviously, there is tension here. I am much more benevolent and open to allowing license here than some. We do need grace and wisdom in this, as with all of life. Thanks for these thoughts Scott. I really enjoyed the Shack once I got round to finishing it. I have rambled about it on my blog and pointed to these posts as I think they are really cool. Thanks David. I appreciated the book as well. Hope to see you at Celebration.